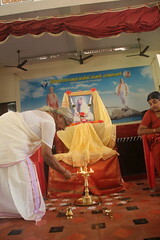 This year Gita Jayanthi and Mathru Puja celebrations were clubbed together. 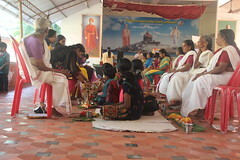 24th December was chosen for the celebration of Gita Jayanthi and Matru puja.The tiny tots of Sandeepani Sishuvihar and the children of Samskar varg, Kodungallur, along with their mothers and grandmothers were present for the programme in the morning. The programme started at 9.30 with the chanting of the Bhagavad Geeta by the inmates of Anandadham, children and mothers who had come for Mathru puja. Mananeeya Lakshmi Didi explained to them that the urgent need of the hour today was to understand the importance of the Bhagavad Geeta in daily life. She urged the mothers to take a resolve to regularly chant the Bhagavad Geeta and try to understand the meaning. This was followed by Matrupuja. Sishuvihar students and Samskar varg children together performed Pada Puja of their mothers or grandmothers. 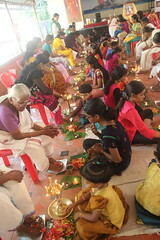 Didi guided the children throughout the puja. Smt Rekha and Smt. 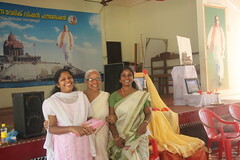 Smitha, who have won panchayat elections under the banner of B.J.P. and whose children are students of Sishuvihar, were felicitated. On the same day, in the evening, it was the first day of the three days residential camp for the SKIE children starting from 24th to 27th December. Thirteen children, 7 girls and 6 boys reported at 5 pm... After registration and wash, they visited the Ganapathi temple inside the campus to watch the evening puja at 5.45 pm. After the puja, a short introduction session was taken by Sri Sudhakarji. Bhajans followed. At 7.30 children were given supper, after which a film show on Mananeeya Eknathji was shown.